Congratulations, winners! The following SciCast forecasters won the second round of prizes: badge merit points. Learn more. Congratulations, winners! 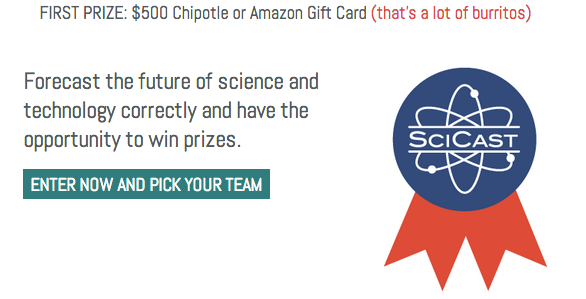 The following SciCast forecasters won the first round of prizes, which included both a $25 Amazon Gift Card and badge merit points. Learn more. SciCast is running a special! On Wednesdays, win a badge for your profile. On Fridays, win a $25 Amazon Gift Card. On Tuesdays, win both a badge and a $25 Amazon Gift Card. On each prize day up to 60 valid forecasts and comments made that day will be randomly selected to win (total limit of $575 per person).